A 16-year-old boy who clung on to the outside of a train he had missed was lucky not to have been killed, Belgian rail operator SNCB said. Witnesses spotted the teenager holding on to a locomotive as the train from Kortrijk to Brussels left Enghien station. The train was brought to a halt in Halle, where security staff apprehended him. Het Nieuwsblad reports that he had arrived a few seconds late for his train, after the doors had closed. The newspaper quotes him saying: "I got on the locomotive because I had to be at home on time for my mum." 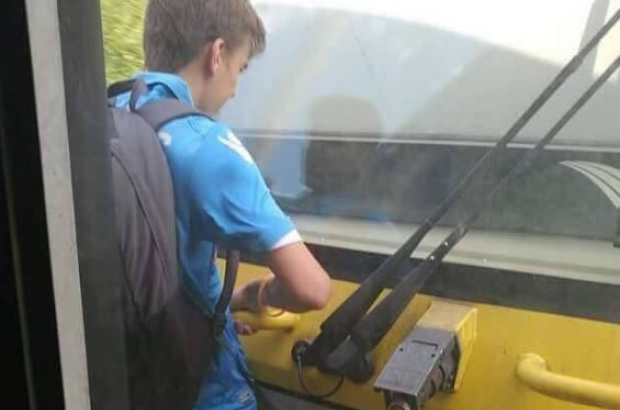 A train driver who shared the image on Facebook said: "What we see in the picture is a young man who is on the footstep of a moving locomotive. This is life-threatening." SNCB spokeswoman Elisa Roux: "The main thing is that he is alive and well - but it could have been a lot more serious. He could easily have fallen off if the train had gone over a set of points and shaken." The Belgian rail operator has established a formal legal complaint and the teenager could face prosecution.